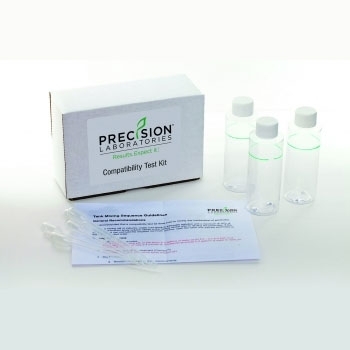 The Compatibility Test Kit is designed to make it easy for mixing and loading personnel, as well as applicators to verify the physical compatibility of various combinations of crop protection products. By using this kit, applicators will be able to optimize the mixing sequence of their desired tank mixes and avoid costly incompatibility and clean-out problems. Precision Laboratories seeks to provide value through tools, such as this test kit, to help users and the industry at large use their resources effectively and properly steward the environment. Correct mixing order and procedures increase productivity and reduce risk.